The AFX-150 combines a precision glass lens with a rich 3.2 MP SXGA camera sensor to deliver outstanding image quality. With 12X optical and 13X digital zoom, the AFX-150 offers the ability to get up close to all the details of your documents, photos, maps, and 3D objects that lesser cameras simply miss. The AFX-150 auto-focus lens makes it a breeze to zoom in and out while you are making your presentation. Adjust optical and digital zoom from your remote and watch while the camera automatically refocuses the lens for a crisp clear image every time. The AFX-150 features a rotating camera head mounted on a flexible gooseneck arm to give you maximum flexibility when capturing images. View from any angle with ease. 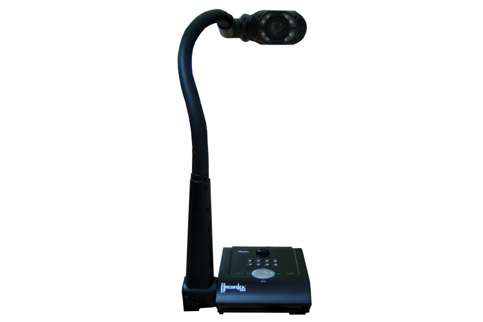 All RecordexUSA document cameras feature environmentally friendly LED lights. Not only do they outlast other lighting options, they use less energy and don’t contain any harmful gasses or chemicals. With both automatic and manual control over white balance and exposure your images will appear exactly as you wish. Let the camera do the work for you, or trust your own eye and tweak the setting manually. Use the built in image and transition effects for smooth impressive presentations. Use the freeze effect to freeze the frame while you transition objects to keep your audience focused on you presentation. The iMMCam AFX-150 features a full suite of effects including split screen, negative image, mirror image, black/white and color image toggle, text mode, and image freeze. Like what you see? Then save it for later. Capture video at 25 fps or snap an unlimited number of still images and save them to your computer through the USB 2.0 connection using the bundled XSight HD Viewer software. Easily edit, manipulate or annotate captured images using your preferred software. The VGA passthrough feature allows for easy displaying of your computer desktop. Snap a still, and annotate over it using your computer and display it to the audience through VGA passthrough. Even store up to 64 hi-res JPEG images to the camera’s internal memory. The truly portable and compact design of the iMMCam AFX-150 make it the perfect desk or AV cart companion. The base measures just 7 ½” x 7¼” and weighs 4.5 lbs. What good is a portable document camera without a carrying case? Tote your iMMCam AFX-150 with ease with our free carrying case. Zippered pockets keep all your cables and the IR remote in one safe place. Our 5-year limited warranty covers all parts including the LEDs. Parts and labor are covered for 5-years. For educators we offer a special 5-year replacement warranty. If the camera has a problem in the first 5 years we replace it! Every document camera from Recordex ships with our all new camera capture and viewing software. XSight HD Viewer for Windows features easy drag and drop image capture for the easiest way to place images from the camera into your favorite Windows application or Interactive White Board Software. Capture and save images directly to PDF, Tiff, JPEG, BMP, and GIFF. Even create multi-page PDFs.